Vehicles with GPS receivers communicating with each other can increase the positioning accuracy to a level that enables them to determine what lane they’re in. Credit: Thanh-Son Dao, et al. ©2007 IEEE. A standard GPS receiver has an average 2D-positioning accuracy of about 13 meters. While this precision is high enough to direct you to your hotel, it’s quite a bit lower than the accuracy required to determine which lane your car is in while driving down the highway. A group of scientists from the University of Waterloo and California Polytechnic State University are currently working on an Auto21 project called Dynamic Collaborative Driving. Within this project, the scientists have developed an intelligent lane detection system that uses communication among GPS-equipped vehicles to achieve significantly greater accuracy than with a single GPS device. Because the new system uses only low-cost GPS receivers, a filter, and an algorithm, it has the potential to be much less expensive – as well as more robust – compared to other lane detection systems. As the researchers explain in their study, GPS errors from multiple sources are common. Errors can occur due to the geometry of visible satellites, atmospheric effects, clock errors, and many other causes. However, the scientists note that GPS receivers that are relatively close to one another experience many of the same errors. This means that, even though absolute vehicle positions may have a large error, the relative position between vehicles has a smaller error, and can provide a more accurate location than a single GPS receiver can. By communicating GPS data among vehicles traveling within about 300 meters of each other, the precise lane of each vehicle can be determined. Emergency vehicles might even be equipped with systems that have a communication range of up to 1 km. In addition to GPS, the other two components of the system are a filter and a Markov localization algorithm. The filter minimizes the measurement noise from different GPS receivers, enhancing the system’s overall quality. Then, the Markov algorithm transforms the GPS data into a lane estimate, without the need for prior knowledge. The algorithm is probabilistic: rather than making a single hypothesis for which lane a vehicle is in, the Markov algorithm maintains a probability distribution over all possible lanes for a vehicle. To determine if a vehicle has changed lanes, the system calculates the shortest distance between the vehicle’s current position estimate and the predicted vehicle path calculated using two previous position estimates. If the distance is close to zero, there is a low probability that the vehicle has changed lanes. If the distance is large, then either the vehicle is switching lanes, or there’s a curve in the road. The lane-finding algorithm can distinguish between these two possibilities by estimating the arc of the road, where a lane change would not form a large arc. Further, if a vehicle changes lanes on a curved road, the system can tell because the vehicle’s previous position will not lie on the estimated arc. The researchers tested the device both in simulations and in real road tests, where they demonstrated an accuracy of between 92 and 99%. They also noted that the algorithm could sometimes anticipate when a vehicle would change lanes before the vehicle had completed the change. They even tested the system’s ability at low speeds by calculating the lanes of two individuals walking down the street holding GPS-equipped laptops, and achieving high accuracy. A lane detection system could have many benefits as a component of an intelligent transportation system. For example, a lane-level navigation system could advise drivers which lane to use to reach a destination without having to make a last-minute lane change. The system could also measure lane-specific traffic conditions, and advise drivers to choose a certain lane to reduce traffic congestion. Safety could be another possibility, with the system warning the driver when swerving within a lane, and even autonomously taking control of the vehicle if needed. More information: Dao, Thanh-Son; Leung, Keith Yu Kit; Clark, Christopher Michael; and Huissoon, Jan Paul. 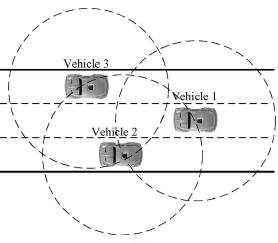 “Markov-Based Lane Positioning Using Intervehicle Communication.” IEEE Transactions on Intelligent Transportation Systems, Vol. 8, No. 4, December 2007. I've been waiting for this quite a while. Bravo. While this is potentially exciting new piece to the autonomous vehicle puzzle, the reality is that it will take many pieces, like DARPA's off road challenge, and faster imaging and AI to get most of us to trust technology with our children's lives... but every step counts, this is a good one. How easy will it be for someone to hack this system and cause cars to crash? A person with a laptop sitting near an interstate hijacking the cars navigation system is a real possibility.